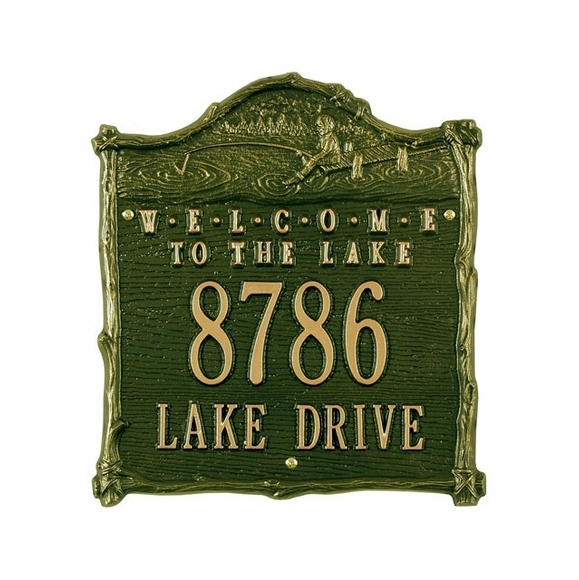 Welcome to the Lake Personalized Address Sign - - aluminum address plaque for your lake house. Made in USA. 12" x 11" arch plaque with a rustic border and a boy fishing above a friendly greeting that says WELCOME TO THE LAKE. Color combinations: BG black plaque with gold characters; GG green plaque with gold characters; OG bronze plaque with gold characters; AC (antique copper). WELCOME TO THE LAKE personalized address sign.